The atlas provides maps of the geographical variations for a range of health conditions and environmental agents at a small-area scale (census wards). The maps have been developed as a resource for those working in public health and public health policy and for the general public to better understand the geographic distribution of environmental factors and disease. It is important to note that simple comparison of mapped environmental agents and health conditions cannot be used to indicate causal associations. For this more information about other factors that might affect disease risk (for example the actual dose received by an individual, the exposure pathway and individual factors such as smoking, other medical conditions and family history) and further statistical analysis would be needed. We thank the various data providers who supplied the data used to create this atlas. The mortality, births and population data used in this atlas were supplied by the Office for National Statistics (ONS), derived from the national mortality and birth registrations and the census. Cancer data are derived from national cancer registries and, for England, was supplied by the ONS and, for Wales, was supplied by the Welsh Cancer Intelligence and Surveillance Unit (WCISU). PM10 & NO2 – The PM10 and NO2 air pollution mapping was carried out for the project ‘Use of geographic information for assessment of human exposure to air pollution’ (PI: Gerard Hoek, Institute for Risk Assessment Sciences (IRAS), Utrecht, The Netherlands. Partners: Imperial College, Department of Epidemiology Public Health, Norfolk Place, London, UK and National Institute of Public Health and the Environment, Bilthoven, The Netherlands.) The project was supported by grant RGI-137 from the Dutch program Ruimtevoor Geoinformatie supported by the Ministry of Housing, Spatial Planning and the Environment. Contains Ordnance Survey data © Crown copyright and database right 2013. 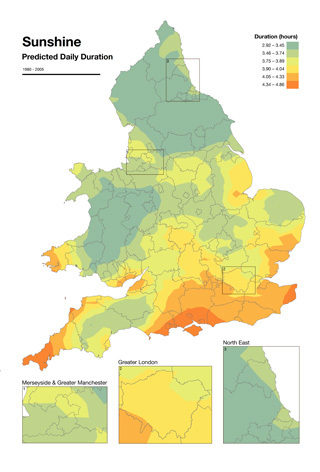 Water chlorination disinfection by-products – The THM data and water supply zone boundaries for the maps were supplied by the following water companies: United Utilities (formerly North West), Severn Trent, Northumbrian Water, Essex and Suffolk, Anglian Water, Bristol, Dwr Cymru Cyfyngedig, Southern, South West, Thames Water, Affinity Water and Yorkshire Water. Contains Ordnance Survey data © Crown copyright and database right 2013. Sunshine duration – UK Meteorological Office. MIDAS land surface stations data (1853–current). British Atmospheric Data Centre, 2006, 26/06/2013. Available from: http://badc.nerc.ac.uk/data/ukmo-midas Adapted from Crown copyright data supplied by the Met Office. Contains Ordnance Survey data © Crown copyright and database right 2013. Fungicides & Herbicides – Countryside Survey 2000 data are used with the permission of the Centre for Ecology and Hydrology, Copyright NERC (National Environment Research Council). The production of the maps was funded by the EU 6th Framework Programme INTARESE project number 018385-2. Contains Ordnance Survey data © Crown copyright and database right 2013. More details on the maps can be found here.